Everyone who has seen these hook and loop targets has commented on how innovative and challenging they are. 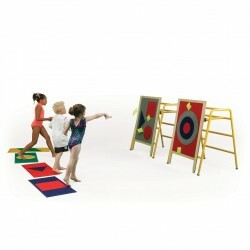 Developed as an aid to throwing and aiming, the targets ensure a high success rate due to the whole of the target boards being covered in hook and loop cloth. One target board has a traditional bull’s eye arrangement while the other has coloured shapes to aim at. The boards are fitted with Gym Time saddle fixings for securing to the large Gym Time trestles or wall bars etc. Supplied with 8 pyramid bean bags and 6 Hook and loop bean bag scarves. The system offers a range of throwing/aiming and ‘beat your own record’ activities. May also be used with rackets etc.